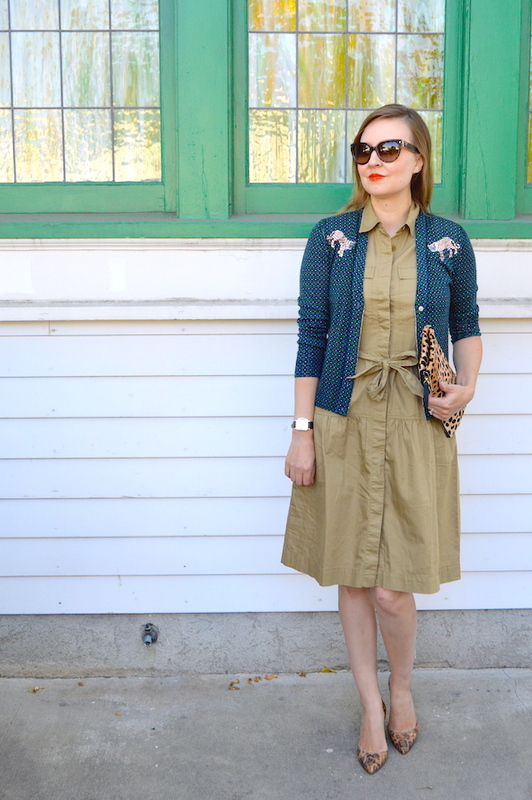 In today's post I definitely look like I am ready to go on a safari—a style safari that is! (The title of this post, like many that have come before it, actually comes from a comment my husband made about my outfit!) Part of the safari vibe of my outfit undeniably comes from my khaki shirt dress. I purchased this khaki shirt dress last year from J. Crew and although it's no longer available, J. Crew has a very similar one for the fall here. Basically, the only difference between the two is mine doesn't have sleeves, while the factory version does. The last time I wore this dress, I actually styled in a similar way here. In today's look, I have on a v-neck cardigan with embroidered tigers. Similarly, the look I wore last spring with this dress featured a red cardigan with zebras on it. Anyway, to augment the big cat theme that is featured on my sweater, I also picked (what else?) leopard print accessories! Normally, I don't like to double down on animal prints, however, I guess that when it comes to animal prints, especially when you're on a style safari, you can never have enough! Wow, love this Katie! You have such a fab eye for putting things together! Thanks so much for sharing with Fun Fashion Friday and have a fun Halloween weekend! I love the outfit Katie. And you accessorize so well ! !